BMW of Springfield NJ’s Service Department and Certified BMW Technicians have been catering to Union County communities since 1965, offering top quality service and care. The BMW of Springfield Full-Service Facility is known for being patient, honest, and fair while consistently demonstrating quality craftsmanship in German engineering the BMW series. BMW of Springfield knows that our customers deserve to be treated like celebrities, and we make sure their vehicles are too since they are the Ultimate Driving Machines. We offer several amenities to meet our customers’ needs including a Night Drop Box and complimentary Pickup and Delivery Service upon request with an appointment. The BMW of Springfield Service Department prides ourselves on giving our customers the star treatment and working with their schedules to provide the best service possible, fit for a celebrity. BMW of Springfield is known for our red carpet experience and now we are backing up our VIP treatment with exciting news. Our service hours have been extended to 7 days a week. Now, the BMW of Springfield Service Department will be open from 8 A.M. to Noon on Sundays to better serve you. Just another way that BMW of Springfield is giving you the status you deserve and the value you expect. We welcome customers from any BMW center with our priority being to display how BMW of Springfield always delivers an excellent service experience, giving you the status you deserve and the value you expect. Our waiting area is comfortably equipped with Wi-Fi, TV, magazines, snacks, hot coffee and various beverages. BMW of Springfield will provide alternate transportation to service customers when requested at the time of service appointment scheduling. We have a fleet of BMW vehicles available for you. In addition, an outside rental car agency that can provide you with a loaner vehicle. You as the customer will need to provide a valid license, valid insurance card, and credit card. The credit card on file will be used to cover potential damages, extra fuel charge, or for any driving violations/tickets. Loaner Cars will be given out with gas, the level of gas in the tank will be recorded. A gas charge will occur if loaner clients do not return the loaner car with the initial level of gas. Smoking is not permitted in any of the loaner vehicles. We are not responsible for any items left in any of our loaner vehicles. Please notify us of any accidents as soon as possible. It is your responsibility to get a police report if an accident occurs. As minor as the incident may be, your personal auto insurance is the primary coverage on any loaner vehicle taken from this facility. Our Loaner vehicles are not to leave the tri-state area without a prior authorization from the management. 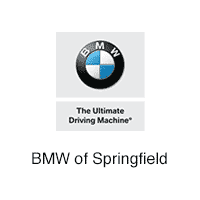 Please help us efficiently serve you and other customers by returning your vehicle to BMW of Springfield as soon as possible to ensure the repairs on the vehicle are completed.